**New for 2013. LG’s Top of the line Cinema 55LA8600 3rd generation passive 3D Ready 55-inch 1080p LED HDTV with TruMotion 240HZ technology. The set displays an outstanding picture for either regular 2D, or in the newest 3D programming. This LG TV uses passive 3D technology and includes 4 pairs of polarized 3D glasses. LG’s Passive Cinema 3D technology allows for lighter, lower cost 3D glasses that don’t need batteries and provide a brighter picture. This is the same type of technology used for 3D movies in a movie theater. You don’t need the glasses to watch regular HD programming. LG’s new LED Plus technology provides an edge lit LED backlight with local dimming technology. This technology allows for better picture and contrast. Its onboard Trumotion 240HZ reduces blurring when you’re watching your favorite sport, action movie, or playing a fast moving video game. 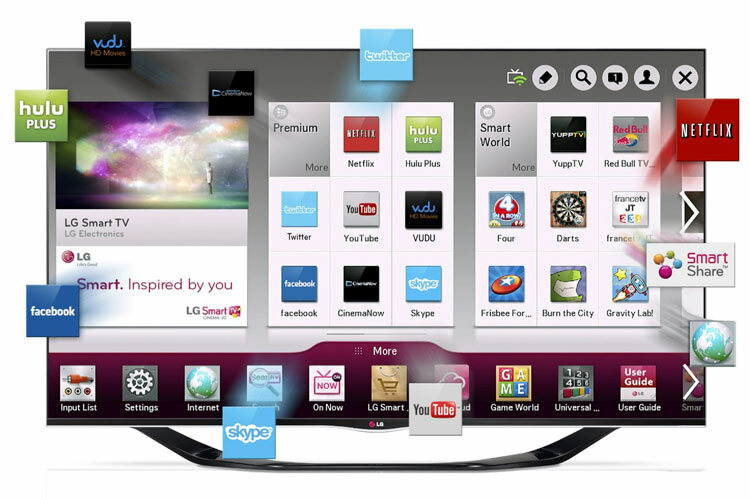 Smart TV: allows you to access limitless internet content, thousands of movies, customizable apps, full web browser, and videos. Voice Control. The 55LA8600 is both Internet Ready , Netflix Ready and has a built-in Wifi adapter (nothing extra to buy). The new Dual Core Processor and Triple XD™ Engine will greatly speed up Smart TV functions. The Clear Voice II feature automatically enhances and amplifies the sound of the human voice frequency range to help keep dialogue audible. The LA8600 Series is DLNA CERTIFIED® and has 24p Real Cinema video processing (for a movie theater experience). Other features include Four HDMI connections for your DVD Player, 3D Blu-ray Player, Game Console and other devices. The 1080p display has over two million pixel resolution, Audio is provided by two 12 watt stereo speakers. Three USB 2.0 ports allow you to view your video and photos on your TV, or listen to MP3 music. NTSC analog and ATSC with QAM digital TV tuners built in. Sleep Timer. Energy Star compliant. Built-in Camera. Smart-Review Commentary: For 2013, LG introduces its third generation of Passive 3D Ready TVs, the LA8600 Series. This model replaces the popular LM8600 Series and is lighter, having shaved several pounds off of last year’s model. This is the top of the line Cinema Screen TV. The 55LA8600 is fully loaded with all the latest features including 3D, LED Backlighting with local dimming, Trumotion 240Hz, Internet Ready, Netflix Ready, with Smart TV. 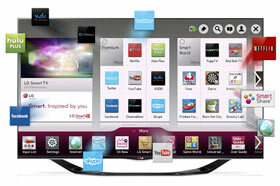 For 2013 this LG TV features a Dual Core Processor to speed up Smart TV functions. LG has also upgraded the speakers to 12 watts each. For internet capability, you can hookup an ethernet cable or use the Built-in wireless adapter. The Smart TV features include a full web browser and a full array of APPs to access internet content, movies, sports, news and TV shows. You can also control the TV with voice control through the remote. The LG LA8600 series is also Energy Star compliant which means it uses far less electricity than other non complaint sets. The new Magic Remote allows you to wave your hand, use your voice, or use a scroll wheel to control your TV. This model has a built-in camera for Skype and other uses. Owners have reported a great 2D and very good 3D picture. Passive 3D technology uses polarized glasses (like the movie theaters). They are lighter and don’t use batteries. If you are looking for a TV with great 2D HD and 3D capabilities (with 4 pairs of 3D glasses included), then the 55-inch 55LA8600 is an excellent value. As with last year’s model, this TV has received excellent consumer reviews. It is a Smart-Review Top Pick for 2013.